Who woulda thunk it - Brooklynguy, lover of all reds light and elegant, got down and danced with a huge famous California Zinfandel the other night, and came out none worse for the wear. In fact, I actually kind of liked it. Turley is a cult thing. People line up for years just to get a chance to be on the mailing list. What does the mailing list get you? The opportunity, or in this case, the privilege, of purchasing Turley wines, which at a minimum of about $40 a bottle, do not come cheap. Lots of people in America spend loads of dough on things that are not worth more than their cache as "hard-to-get." Think Hummers, fancy audiophile stereo equipment, or Gucci sunglasses, for example. There are cheaper alternatives to each of these products, but these offer the consumer something other than an SUV, the ability to listen to tunes, or shade from the sun. These products offer the cache of their brand name - the consumer drives a HUMMER, not an SUV, and everyone knows what that is, and covets. No question about it, people are like that with wine. Is Sine Quo Non really that good? Screaming Eagle? I have never the wines of either producer, so I cannot say. But I'm gonna lay my cards on the table on this one folks: I bet that I would think they are NOT really that good, not worth the money anyway. Up until recently I would have included Turley in that list of cultish wines that I wouldn't waste my money or psychic energy attempting to sample. I am not the first blogger to be surprised by Turley wine and I will not be the last, I suppose. A few months ago my good pal NorthCarolinaGuy told me about this wine he tried at a tasting, a wine that was haunting him since he tasted it. "What wine?" I demanded to know. He told me to keep an open mind, and said it was a Turley Zinfandel, the Juvenile wine. "Huh," I said, trying not to reveal my dismay. He got three bottles from his friend who donated a kidney in order to get on the waiting list and promised to taste this wine with me sometime, to prove that it is good. This is a promise I will now very carefully hold him to. Turley makes red wine from Zinfandel, Petite Sirah, and Grenache. They also make white wine from Rhone grapes like Roussanne and Marsanne. They are famous for Zin though, and at at least 15% alcohol, they are the epitome of the big beefy California Zin. There are upwards of 10 single vineyard Zins produced by Turley, and the devoted hoard them all like fiends. Okay, that's an exaggeration. They do like them a lot though. They come in a uniquely shaped bottle, very bottom heavy with a thin neck, absolutely impossible to fit in a wine rack, which is the real reason that I just can't keep them around the house. So when Mike opened a bottle of Turley at his BBQ the other weekend, I was pleased to have the opportunity to taste this rare and deified wine. I expected not to be impressed, to chuckle with BrooklynLady at its huge fruit bombiness, to scoff at the hapless rubes who buy this stuff. But wait a minute...it was good. Really good! Surprise surprise, we both liked the Turley. Maybe I should get that Hummer, and I am definitely buying BrooklynLady some Gucci sunglasses for our anniversary. 2003 Turley Zinfandel Keig Vineyard, $ unknown. Deep dark purple, a teeny bit cloudy. Blackberry, baking spice, and earth aromas literally burst upward from the glass. Really impressive nose, even after the initial rush, enticing with sweet fruit and earthiness. Smooth as silk on the palate with no heat from the more than 15% alcohol. Rich and extracted but not overpowering, lots of dark sweet fruit and some chocolate too with a lingering fruity finish. Don't worry, I'm not selling my soul for Turley. I am still not convinced regarding the merits of Zinfandel. But it goes to show me, don't judge a wine by its label. And for those of you in the NYC area who are not willing to part with internal organs to get on the mailing list, Chambers Street sells Turley wines, a few bottles anyway, right of the racks. I'm already a believer in Long Island wine. Multiple mini-tastings at Vintage NY, a bottle here and there at home, and a visit to the North Fork last summer convinced me of the high quality of many Long Island wines, and of the potential of the region in general. So Brooklyn Uncorked, a tasting of Long Island wines featuring at least 25 producers, was not some sort of test for me to decide whether or not I like Long Island wines. I already like them. The reds tend to be somewhat "old-world" in style - they offer complexity and balance that can be elusive among new world wines made with the big three Bordeaux grapes. They typically clock in between 12-13.5% alcohol. They are not "fruit bombs." They are Long Island wines, the producers are not using grapes grown in Long Island to make California style wine. They grow and make good Cabernet Franc. Lenn says some of the wines are in the Loire style. If by "Loire style" he means delicious, I agree. If by "Loire style" he means similar in terms of typical aroma and flavor profiles, or in terms of texture - the general feeling of the wine, I am not so sure I agree. I have found Long Island Cab Francs to be very good in general, in their own dark, thick, fruity way. Not in the peppery and animal-earthy, mineral, medium bodied translucent style of many a good Chinon or Bourgueil. If I had to compare Long Island Cab Franc to Loire Wine, I would say that the more extracted wines of Saumur-Champigny are the most similar in style. The producers I have met have, to a person, been friendly, inviting, eager to discuss their wines and other wines from Long Island, and incredibly open about how they make their wine. In other words, I find Long Island to be a user-friendly place to drink and to learn about wine. It's local - drink and eat local as often as we can, right? I don't like everything about Long Island wines, though. My big issue right now is quality to price ratio (QPR). A good bottle of Merlot, Cabernet Franc, or Chardonnay from Long Island usually costs the same as a better bottle of wine from elsewhere. Yes, there are exceptions. A very tasty bottle of Loire Cab Franc from a good producer can cost about $15. That same producer's top bottle might cost about $25. That being the case, it's kind of hard for me to justify buying Long Island Cab Franc for $35. So, back to Brooklyn Uncorked. A great opportunity for me to taste a load of Long Island wine in one sitting (standing, and walking actually). I was excited to move beyond Cabernet Franc, to explore other wines from the region, particularly the whites. I started out by following Lenn around, took his guided tour of Long Island whites, tasting many a Sauvignon Blanc and Chardonnay. I was very impressed with several of the un-oaked Chards that I tasted, some were priced really well too. I learned, though, that I am not a fan of the Long Island style of Sauvignon Blanc, which based on the wines I sampled at this tasting, is super pungeant, o'er brimming with cat pee aromas. I prefer a more subtle style. I did not taste every wine that was offered - I ran out of time. I may have missed some great stuff. Three producers that I did not taste, much to my regret, are the reds of Castello di Borghese (I was really impressed in their tasting room last summer), Wolffer Estate (loved the bottle I had at Home restaurant recently, and Schneider Vineyards (supposedly very good Cabernet Franc), which for some reason, was not present at this event. Here are some notes on the wines. "5"s are my favorite wines of the tasting, a"1" is a wine that I just didn't like. "3" is a wine that I would not necessarily seek out to buy for my cellar, but I would gladly drink anytime. 2006 Channing Daughters Scuttlehole Chardonnay, $15. Un-oaked, crisp, fresh fruit, good acidity. The best value white of the tasting, in my opinion. Maybe the best white of the tasting, period. 2004 Shinn Estate Vineyards Cabernet Franc, $38. Excellent wine. Spicy, ripe with juicy fruit, great balancing acidity, a sense of soil. If you’re a Bordeaux-hound then this is a steal at $38. Check it out. If you are a Loire-head, then you can do better for your dough. 2001 The Lenz Estate Selection Merlot, $22. now here it is, a beautiful red wine from Long Island with an attractive price, representing great QPR. I will admit that I loved the 2000 vintage of this wine, so I might be a bit biased. Blind Long Island red tasting anyone? Earthy nose of dark fruit. Silky and smooth but well structured, flavors of dark plums, dusty earth, some herbs. Sign me up! 2005 Lieb Pinot Blanc, $19. Nice floral aromas, fresh peach and citrus flavors, medium bodied and fleshy. 2004 Paumanok Barrel Fermented Chardonnay, $19. My favorite oaked Chard of the tasting. Fresh melon aromas, a hint of wood maybe, but not at all overwhelming, well balanced. 2005 Waters Crest Private Reserve Chardonnay, $25. This sees some oak also. Well balanced with nice tropical and floral aromas. Good fruit and nice acidity. 2003 Scarola Vineyards Chardonnay, $13. A lovely steel tank Chard, with bright fruit flavors and good acidity. Not offering quite the same pelasure as the Channing daughters wine in my opinion, but quite good, and at $13 it's sort of hard to argue. 2004 Shinn Estate Vineyards Estate Merlot, $25. This bad-boy has almost 20% Cabernet Franc in the blend. Maybe that accounts for the lovely floral aromas? Also tobacco and earth on the nose. A firm mouthfeel, with nice red and dark fruit on the palate, and an interesting mineral finish. I liked this wine very much. NV Shinn Estate Vineyards Red, $15. This is Shinn's non vintage, basic red wine, and it's surprisingly delicious. At 75% Merlot and 25% Cabernet Sauvignon, you might think it would be a hearty wine, but I found it, in an odd way, to remind me almost of a Cru Beaujolais. Somewhat because the fruit flavors were bright and light red, but more so because of the moutfeel - gentle and easy with not much evidence of tannin. I bet it would be great with a slight chill in the summer. 2006 Paumanok Semi-dry Riesling, $22. A lovely surprise, the only Riesling I tasted. At 10% alcohol with plenty of residual sugar, approaching a German Kabinett style. Drinking very well now (the wine maker said that this will not age as well as a German wine), vibrant stone fruit, some flowers. 2005 Channing Daughters Enfant Sauvage Chardonnay, $35. Made with local yeasts, spends time in new oak. Lots of banana and tropical fruit on the nose, a bit flabby still. Will this balance itself out? 2006 Channing Daughters Pinot Grigio, $18. Pinot Grigio from Long Island...who knew? This one is more in the Italian style (no surprise, given the name), as opposed to the Alsace style that Oregon, the major new world Pinot Gris player, has adopted. Fresh and lively, nice citrus flavors, nothing complex, but very pleasant. Yes, this wine is more expensive than the superior Scuttlehole Chardonnay...life is strange. 2006 Waters Crest Chardonnay, $18. Great nose of fresh ripe fruit, some mineral. The palate does not quite live up to the nose right now, but tasty. 2005 Waters Crest Nightwatch, $45 (375ml). The only dessert wine I tasted. This one is a blend of Chardonnay, Riesling, and Gewurtztraminer, I believe. 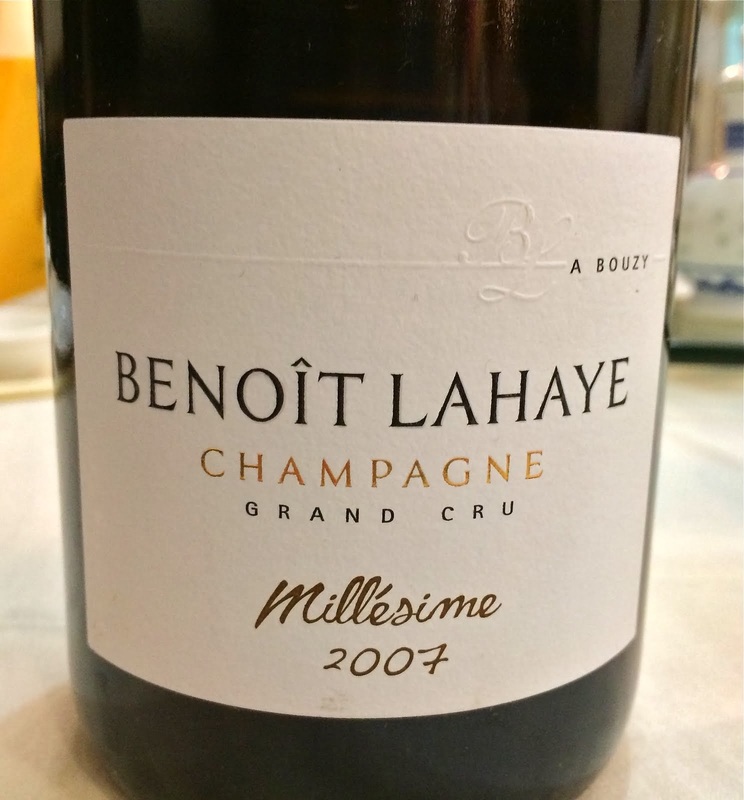 A lovely full gold color with orange hints, and a wonderful nose of ripe peaches and other stone fruits, ripe pineapple underneath, some floral notes too. Just a great nose. The palate to me, though, was not focused, a little flabby. The wine was quite viscous with an aloe-like sensation. I definitely liked this wine, but at $45 for a half, it's just too easy to do better in the dessert wine world. 2006 Shinn Estate Vineyards First Fruit Sauvignon Blanc/Semillon, $23. The blend with Semillon (4%) and that this wine sees oak seems to indicate that Shinn is going for a white Bordeaux style wine. Nice nose of citrus and some flowers, crisp and fresh fruit flavors. 2004 The Lenz Old Vines Merlot, $??. Fruity nose, bright raspberry and some dark fruit flavors, a bit tannic. Yummy. Did I make a mistake on the vintage here - shouldn't this be 2001 or 2002? 2003 The Lenz Merlot, $15. Spicy nose of dark fruit, leathery dark plums on the palate. This is their basic Merlot and it's pretty darn good. 2005 Corey Creek Cabernet Franc, $30. Nice floral nose, smooth red fruit palate, very pleasant, if not all htat complex. Steep pricetag though. 2004 Waters Crest Cabernet Franc, $??. Spends a year in oak. Funky earth aromas, some flowers. Sweet red fruit, very grippy - too young for me to really tell what's going on here. 2004 Waters Crest CR, $??. CR stands for Campania Reserve, Campagnia as in the Italian region known for red wine made from Aglianico and white from Falanghina. This wine is 80% Merlot, so I'm not sure that I understand the name, but whatever...The wine had nice dark fruit aromas, and a very grippy mouthfeel - probably a little too young to drink, but very tasty fruit. 2003 Roanoke Vineyards De Rosa Red Table Wine, $30. Lots 'o leather on the nose, earthy palate with dark fruit character. Nice wine, not a great value though. 2004 Shinn Estate Vineyards Nine Barrels Reserve Merlot, $43. Good fruit on the nose, incredibly tighly wound palate. I honestly couldn't assess this wine because it isn't ready for drinking, in my opinion, but as Shinn wines were clearly my favorite of the tasting, I figure this should get the benefit of the doubt...stiff pricetag though so you're really keeping your fingers crossed that this wine will grow up to be beautiful. I will not go into specifics, actually, because I don't feel like disparaging the wines from my local region based upon only one tasting. Instead I will just mention a two things that irked me: $30 for The Lenz Sparkling Wine? C'mon, I can buy a fantastic small grower Champagne for that, or a lovely NV Perrier-Jouet. And the wine was just no good, in my opinion. Nice enough nose, but a strange and flat palate. And secondly, did I mention that I did not care for any of the Sauvignon Blancs that I tasted, except for the Shinn blend? Okay, that's it. thanks for comin' out tonight, folks. Brooklyn Uncorked was a lot of fun last week, tasting loads of Long Island wine, enjoying a nice outdoor lunch, and most of all, hangin' out with a couple of bloggers - Lenn of Lenndevours and Tyler of Dr. Vino, and Lenn's buddy Matt. You know how sometimes when you meet someone that you previously know only through email or phone, they can completely surprise you? How sometimes they just don't conform to any of your expectations? This was not the case with Lenn and Dr. Vino. They were essentially how I imagined them - absolutely and genuinely good people. Good humored, relaxed, excellent company. There were a few, shall we say, "quirks," though, and I thought of a fun way to share them with readers out there. After our lunch, upon arriving at the tasting, donned a white medical robe with "Dr. Vino" stitched in red over the breast pocket. Wore this for the first 10 minutes of the tasting. Used a nose dropper to take a sample of the Touraine Sauvignon Blanc we had with lunch, took home in a small vial, "for testing," he said. Is not drinking bottled water these days, but brought his own tap water, in a plastic bottle, to the restaurant. Measured the pulse of Shinn Estate Vineyards co-founder Barbara Shinn. Proclaimed her to be "very healthy." Ends his wine classes by asking students to play "show, tell, and taste." Asked for garlic powder at lunch after tasting his skate fish. Upon being told that the chef does not have garlic powder, produced his own from a bag of organic spices that he carries around. Is at least 6 foot 3 - probably taller. Brought and used his own tasting glass - engraved with the Pittsburgh Steelers logo. Spat at the tasting, but never in the spit bucket. Usually on the floor. All of the LI wine makers seemed to be used to this - no one asked him to stop. Knocked into NYTimes Long Island wine writer Howard Goldberg, causing him to spill the contents of his glass on his (Howard's) blazer..."by mistake." Glared at Lieb Cellars pourer somewhat threateningly until she produced an unlabeled bottle of 2006 Sauvignon Blanc for us to taste. Lives in Long Island for years now, but had never set foot in Brooklyn before this event. Tried to get me to "chug-a-lug" a half bottle of late harvest Chardonnay dessert wine with him. Okay, that was fun. More about the wine next, and all of that will be the truth, Ruth. Scallops have always been difficult for me in the kitchen. I never seem to brown them properly, as I am afraid of cooking them too much so I don't use high enough heat or cook them long enough. This time I asked the fish people for their biggest scallops in order to cook 'em on the highest heat for as long as I could. So, my non-stick pan, high heat for a few minutes before the oil even went in. Then heat the oil for a few more minutes. Either I would brown these things or destroy them. The scallops go in the pan...sizzle sizzle sizzle. Don't move them, don't even touch them. I'm using tongs in order to grab and turn them easily. A minute goes by, they release a small amount of liquid into the pan. Another minute...this is nuts, they must be burning. So I grab them with the tongs and turn them. Well blow me down - they're browned and beautiful. Another two minutes on the other side and presto - scallops! Seems like I may have finally figured out the mystery of decent scallop cooking. This was an appetizer with the back end of the season's asparagus and a simple sauce made with fresh squeezed blood orange juice. Main dish was flounder baked en papillote (parchment paper) with sorrel and tarragon. I wanted a Sauvignon Blanc to pair with this meal but I realized that I had not even one bottle in the house. So I decided on a Savennieres, the entry level wine from Domaine du Closel called La Jalousie. This is not only a window that allows for a peek into their more serious wines each year, it is an excellent dry and mineral Chenin Blanc, a bright and delicious wine that loves seafood. I like this combination of buttery scallops, grassy asparagus, and sweet acidic blood orange sauce. Nothing too fancy, just market fresh food, and this time I didn't wreck the scallops. And La Jalousie - let's just say that I cannot wait until the other 2005 Closel wines are released. 2005 Domaine du Closel Savennieres La Jalousie, $20. Light straw color. Bright citrus and wet stone smells, a hint of honey too. Firm on the palate, nice tension between the acid and the ripe fruit. Flavors of green melon and lemon oil, lanolin, and a nice vibrant finish with a bit o' honey. Good acidity to balance things out. An excellent mid-priced bottle, highly recommended. Here we are again folks, Wine Blogging Wednesday is upon us once more. Lenn's idea is now almost three years old! This month we must thank the noble Doktor Weingolb for hosting. He has gone above and beyond the call of duty in providing lots of information regarding his chosen theme: wines from the Languedoc-Roussillon region of France that are priced between $15-30. Mid-priced Midi wines, if you will. And I certainly will! The Languedoc-Roussillon, also known as the Midi, is a huge area west of Provence, south of the Rhone Valley, just northeast of the Spanish Pyrenees, all of it draped around the Mediterranean Sea. This is hot weather France where hardy grapes thrive, like Grenache and Mourvedre, Cinsault and Carignan, and of course, Syrah. There are many appellations in the Midi. Some folks feel that the area is really too large to be one wine region, that the western part, the Roussillon, is distinct from the Languedoc. 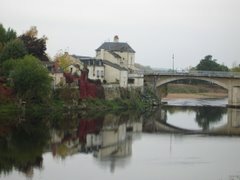 And within the Languedoc, for example, that the Coteaux du Languedoc appellation is too large and should be divided up. I do not have the knowledge or experience to add anything to that debate, but I will say that I have felt intimidated when I think about delving into the wines of the Midi. Is St Chinian different from Fitou? From Minervois or Corbieres? And if so, how are they different, aside from being in different places? Do they permit varying percentages of Syrah, for example, or it is an elevation and wind thing? Where would I start?!? I usually give up and walk back to the Loire section. But Marcus' theme got me thinking...if I am trying to lower my average $ per bottle average, at the same time refusing to sacrifice quality, and while accepting the fact that I am an unabashed lover of French wine, I might need to get to know the Midi a bit more. For WBW #33 I combined this sense of experimentation with another idea that appeals to me in wine and wine making - natural wines. I noticed that several Midi wines were poured at Dressner's Real Wine Attack tasting a while back, a 2004 Mas de Chimeres Coteaux du Languedoc among them. I liked the wine at the tasting, so why not follow up at home where I can experience it over the course of a few hours with dinner? Unfined and unfiltered, aged in wooden barrels, in the 2004 vintage the wine is about equal parts Grenache and Syrah, with some Cinsault and Mourvedre for good measure. A southern country wine, a lusty blend, that seemed to call for lusty food. How about the hormone-free, organically fed and raised, free roaming, registered democrat lamb shoulder chops I grabbed at the Farmer's Market? Roasted with herbs, some spring vegetables on the side, sounds like a pairing. BrooklynLady and I decided on asparagus, as they are perfectly in season and just beautiful right now. Also some pink potatoes roasted with a little garlic. For the lamb, we used the mortar and pestle to grind some aromatic fresh mint into a paste, added a little salt and some good olive oil. Shoulder chops can be a little tough if you just sear and eat, like a loin or rib chop. I like to sear them in a hot pan, and then finish them in a 350 degree oven for about 10 minutes. They are just a bit pink, but a more tender than they are when left rare. 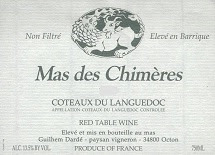 2004 Mas de Chimeres Coteaux du Languedoc, $17. Incredible vibrant ruby red color, almost electric under the light, yet completely translucent. Warm and inviting aromas of raspberries and dusty earth. I found concentrated and juicy red fruit on the palate, BrooklynLady found intense bloody meat also. Interesting, but a little disjointed. After about 45 minutes when we sat down to dinner the wine was more balanced and complex, the fruit more relaxed, some herbal qualities present, and an interesting finish of what to me was, and get your alliteration meters ready for this one: chocolate covered cherry cordial candies. Very sappy, lots of kirsch. The tannic feel of this wine was very different from that in the Loire reds and Burgundies I am used to. These tannins were exquisitely fine grained, which made the wine feel expansive and lush in the mouth. I was very much impressed by this wine and would definitely buy it again. A wine of this quality at this price without question has a place in my drinking rotation. My only issue is that it clocks in at 14.5% alcohol, which is about 20% higher than what I'm used to. Hard to have a glass while cooking, and then another and a bit more with dinner at that alcohol level. I mean c'mon folks, I have to be able to change and feed the baby daughter later on, and to do so with nimble, loving, and sure hands. I know that many Rhone reds are high in alcohol too, there must be something about these grape varieties in this climate that leads to higher alcohol wines...not a criticism, just a point of interest. But it might lead me to look elsewhere when deciding what to open for sipping on the deck. This bottle of lushness needs food and at least two other people around, or things can quickly get out of hand. So are there high quality and mid-priced Midi wines out there at lower alcohol levels? Many thanks to Marcus for being such a gracious and kind host, and for making it so much easier to get a little Midi experience. I'm coning back for more. I am finding that the un-oaked whites from the "lesser" regions of Burgundy are just fantastic in 2005. That they are reasonably priced makes the whole thing happy for everyone. The two "lesser" regions I refer to are the Cote Chalonnaise and the Maconnais, both south of the Cote de Beaune and north of Beaujolais. There are some excellent wines, both red and white, coming from these places. I prefer the whites in general, as the mineral soil and the tendency NOT to oak the Chard just works for me. The reds can be a little high toned and cranberry-shrill for me, but I should taste more. But back to the whites...I cannot get that 2005 Jean Manciat Macon-Charnay out of my mind since I first had it at a tasting. So bright and fresh, such lovely flavors, so well balanced. And $17 before the mixed case discount! Yeah, I am now the proud owner of a few more bottles. And it ain't all Manciat, people. 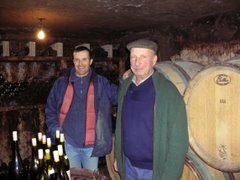 I tasted another simply excellent 2005 un-oaked white Burgundy the other day, courtesy of the ever generous Deetrane. He busted out a screw-cap 2005 Girardin Rully Vielle Vignes under the late Sunday sun in his backyard. A little reserved in the nose, but the palate was singing. 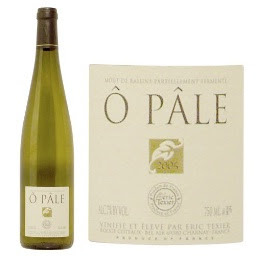 Crisp and pure, great balance of citrus, stone fruit, and mineral, with nice acidity. BrooklynLady made hers disappear right quick. Deetrane said it would go for about $25 retail (he, of course, purchased his on wine commune for about $10/bottle). This makes the Manciat a better play, but the Girardin wine is absolutely worth seeking out too. I would love to have a half case of this in my racks, along with another of the Manciat. Bring it on, summer time Saturday night seafood dinners on the deck with pals! It was breezy on Friday evening. There was a slight chill in the air, as if Mother Nature was breathing a sigh after working all week to keep the days nice and warm. But maybe that chill I felt on my deck was not so sweet after all. Maybe the chill I felt was in fact a harbinger of the menace that would soon come to my Brooklyn home, the upheaval of all that is kind and good in my kitchen. Yes, dear reader, on that Friday evening I would soon witness a brutal triple murder, carried out by a cold blooded killer whose icy imperviousness to cries for mercy would stun even the most hardened of assassins. But back to the innocent times before the terror, the light spirited and jazzy times in the kitchen on a warm and breezy Friday evening. Adam arrives with two large bags of provisions and I set about making a couple of aperitifs. He opts for an old favorite of mine, one that I learned to love in France - anise liquor with cold water. I don't know the name of this drink, but it's just delicious. I use Pastis, the nut-brown colored French spirit, about two fingers worth in a tall glass. Then present it to the drinker along with fresh cold water, preferably in some sort of cute little pitcher. Slowly pour in about four parts cold water and the mixture turns cloudy white. It is aromatic, spicy anise tasting but very cool and refreshing. Try it next time you're at a bistro and you'll see. Perfect for before dinner. I went with another old school favorite, a negroni. Some folks call this an Italian martini, as it involves Campari, the Italian red herbal/medicine flavored liquor. You simply stir 3 parts gin, 2 parts red vermouth, and one part Campari in a shaker with ice. Pour over a couple of cubes in a rocks glass and bliss, my friend, bliss. Standing and shooting the bull with Adam over drinks, I noticed one of his bags moving ever so slightly, but I quickly dismissed it, chalking it up to the heady negroni on an empty stomach. But no, there it goes again. "What's in the bag, buddy?" I ask. "Lobsters, dude. I brought lobsters for the grill." "Wow, very impressive. Do we boil them first or something?" Now if this was a private detective flick set in 1950's LA, this is the part where I sit in my office alone after dark, light from the street lamps coming through blinds on the window, smoking my umpteenth cigarette. A beautiful dame knocks on the frosted glass door of my office, bringing with her a whole world of trouble. "Nope, we don't," Adam says. "We just cut them in half and put 'em on the grill," He sniffles a bit, and stared blankly off into the distance. As I begin to calculate how exactly that will work, imagining hacking a live lobster in two, wondering if there is any way to prevent the obviously insane Adam from carrying out this gruesome act in my kitchen, I am startled by the buzzer. Jake's here too now. Big Jake, all 6 foot 4 of him. Maybe he can restrain Adam while I call the ASPCA. Jake comes in and after a few hellos there is an awkward quiet. Adam, a gleam in his eye, grabs a long kitchen knife and begins to hack at a couple of fennel bulbs, scalping them, if you will, removing all the green hairy parts. He slices up the bulbs and drops them in hot olive oil with salt and pepper. "I'm gonna cook these suckers down for a while, really braise them good," he says. Is that drool in the corner of his mouth? "What are we grilling?" says Jake. "Lobster." Adam sings the word, stretching it into at least 3 syllables. He and Jake stand smiling at each other like the lunatics that they clearly are. I am now along with two lunatics, one of them 6 foot 4, the other holding a long kitchen knife, my sleeping daughter in the other room. Out of the bag quickly come the 3 doomed beasts, waving their rubber-banded claws violently as Adam holds and examines them. "Do you know about lobster claws?" Adam monotones, never breaking eye contact with the crustacean. "One is the pincer, one is the crusher. This one," and he holds the claw only inches from his face, "this one is the crusher." Jake stands near Adam, hands twitching. The lobster jerks her (Adam got all female lobsters, as he likes to eat the eggs) tail into a ball and Adam drops her. She's on the cutting board making a run for it. "This is gonna be just like Annie Hall" I say, and laugh nervously. " Annie Hall guys, remember, with the lobsters?" They have no idea that I'm even in the room. Adam grabs the lobster and turns it on its back. Jake holds it down by the tail. Adam looks up at the ceiling for a moment and closes his eyes, and then brings the blade down between the lobster's eyes. "This wills stun it before the kill," he says. It stops moving, mostly. He then in one stroke calmly cuts the lobster in half lengthwise. There is some twitching, but mostly, the animal is quiet. Adam wipes his mouth with the back of his hand. "Let's do the others now," he whispers. "I will go get a shovel so we can bury them," I say, starting for the door, but they're having none of it. "DON'T move," Adam says without looking up from lobster number two. "We're gonna finish this thing right now." I make myself another negroni, but without the Campari or the vermouth. It's straight gin now, pal, and I deserve it. There is black lobster water/juice all over my cutting board and counter. Next thing I know there are 6 lobster halves and 6 dismembered claws on a white platter. The hardwood coals on the grill are approaching optimum heat - you can keep you hand over them for a few seconds. Jake stands over them, gazing into the grill. Adam talks quietly to the lobster pieces as he rubs olive oil and salt onto their flesh. I try to image a wine that will pair well here. What goes with braised fennel, green salad, bread, grilled lobster, and murder? How about a 1996 Francois Cazin Cour-Cheverny Cuvee Renaissance? The bright white made from Romorantin, in this case, botrytized grapes, creating a sweeter wine. This is the beautiful dame knocking on my office door, all honey and acid, with a lingering finish. She is aromatic, with notes of kerosene to complicate her honeyed fruit. But it's on the palate where she knock you out, such purity, such great texture, like a silky honey blanket and then a slap of bright acidity. Adam removes the lobsters from the coals and plates them along with the fennel. The steam curls into the night air, eerie in the candlelight. "Sit down where we can see you," Jake says, and puts a plate in front of me, one with both a pincer and a crusher on my plate. "All of us are going to eat this," Adam says solemnly, and he raises his glass. We drink, and the dame is indeed beautiful. Adam and Jake begin to eat from the corpses of the lobsters. After a few moments they stop look up at me, their lips glistening with oil. As if in a trance, I take a piece of tail from the shell and lift it to my mouth. I eat it, and it is good. I drink in more of the dame, and she is still in a loving mood. The rest of the meal goes by like a dream, empty shells piling up in a silver bowl. Fennel - gone. The dame? By now, she is gone too. The three of us limp at the table, finally sated. "We better get moving," Adam says to Jake, and like that, they are gone. Five minutes pass and BrooklynLady returns from her night out. She kisses me and says "what's that you've been eating? Where is the baby?" I look at her, my beautiful wife, and I am grateful for her and for my daughter. "Lobster, baby. I've been eating lobster. Adam and Jake killed it, and we all ate it. And I loved it!" I know that some of you might be disgusted by this tale of wanton violence, but I warn you, don't even bother going to the cops. My place is completely clean. And Adam? Last I heard, Adam was skulking around the docks on the Maine coast. And no one has heard from Jake since he left my house that night. So let's just let this one be, dear reader, just let it be. I live out each day, damned to star as the main character in the charade that is my peaceful law abiding life as a devoted husband and father. Only I know what happened that night, and what it is that I am actually capable of, the evil within. So take my advice and forget all of this. 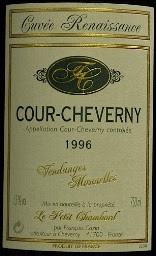 But if you come across that '96 Cour-Cheverny, grab it. Consider this your reminder - next Wednesday May 16th you will, for the reasonable price of $30, have the opportunity to taste a load of Long Island wine. Come on down to Brooklyn uncorked! That's right, Shinn, Castello di Borghese, Paumanok, The Lenz, Macari, Wolffer, Palmer, and many others will be pouring their wines at the Brooklyn Academy of Music (BAM) from 6:00 PM - 9:00 PM. New York is making great wine these days, Long Island in particular. This is a great opportunity to sample some excellent local wines, to meet fellow wine lovers, and to support local business. If you're in the area, you really should just get your &%#* together and come on down - no excuses. 2003 Marechal Savigny Les Beaune Vieille Vignes, $ unknown (restaurant purchase). I have come to expect excellent wines from this producer, and I remember enjoying the '03s in general. If I'm not mistaken, it was this wine that won the NYTimes tasting panels' "Village Burgundy" blind tasting a little over a year ago. We were not so impressed this time, though. Maybe this wine is not that long lived, as the '03s are low in acidity. Not likely - it's only 2007. In any case, reserved aromatics, some red fruit and a bit of earth. Somewhat flabby palate reflecting the same. Not terribly complex, some baked characteristics. Pleasant, but not worth seeking out. Maybe the restaurant (Savoy) didn't store the wine properly...? 2005 Paul Pernot Beaune Clos du Dessus des Marconnets, $22. Back here I first wrote about this wine, so this is the second bottle we opened. I will admit - I was worried based on recent bottle variation issues, that this wine might not be a good as I remembered. Wrong. just as good. We enjoyed it with rack of lamb and turnip puree, and it the wine was excellent. Interesting aromatics, loaded with underbrush and dried leaves. Also some sour cherry and strawberry. Light to medium bodied texture, great acidity and balance, there is still some sappy baby fat on the palate. The fruit is ripe and lovely. It might be hard not to drink all of this young, but I am curious to see how it ages. This is honestly a steal at under $25. 2005 Desvignes Morgon Javernieres, $21. I really liked this wine the first time I tasted it. It was every bit as good this time, but it definitely needed some air time to get there. Plenty of fresh strawberries and raspberries and a little funk on the nose. Zippy and juicy palate of ripe strawberry with nice dusty tannins. An excellent Beaujolais. 2005 Jean Manciat Macon Charnay Franclieu, $17. This is a real find for me because I have basically given up on Chardonnay at this price point. I just never like it as much as I like other whites at the same price point. But this wine is an exception. Nice aromatics - ripe stone fruits, some citrus, some tropical fruit. And this is steel fermented wine - no oak! These are the aromatics of the grape as grown by this producer. The wine is lean with good acidity. There are floral and mineral flavors to go along with the citrus and stone fruit. A definite re-buy for me - this is as good as any white I know of that is currently on shelves and under $20. 2003 Bergstrom Pinot Noir Cumberland Reserve, $34. A few years ago I was a real fan of this wine. Not so sure now. It is a brawny style, rich and heavily extracted. And it clocks in at 14.5% alcohol. I wanted to like it because I have a few more bottles, but BrooklynLady and I agreed - it's just not that good. Sappy pine smells, and lots of heat from the alcohol. Unfocused palate without any defining characteristics. BrooklynLady said that she would not have known it was Pinot had I not told her. Is this Bergstrom in general or just this cuvee, I wonder. In any case, I would have to taste first before buying any further Bergstrom. 2003 Delesvaux Coteaux du Layon Selection de Grains Nobles, $30 (secondary market). For some reason I often find particularly good deals on Loire dessert wines on web auction sites like Wine Commune. Good can mean half price or better, as in this case. I don't seek out Loire whites from '03, as the heat kind of did away with the acidity, but supposedly the sweet wines survived well. Not sure I agree based on this as an example. This wine was amber in color with pronounced ripe pineapple on the nose, some caramel too, with a little whiff or roast nuts. The palate was not as complex as the nose - honeyed with some mineral notes, but too much flab. Acidity definitely lacking, and the wine wasn't balanced because of it. One interesting thing - the texture was almost aloe-like in viscosity. Fresh oregano in the mortar and pestle with a few cloves of garlic and some kosher salt. A little olive oil (safflower is good too, and allows the oregano to shine a bit more) and then rub the paste all over the pork loin. Generous salt and ground pepper, let stand for at least a half hour. Layer a pan with potatoes (I like a mix of white and blue for color), toss in olive oil and a little salt. Place a few sprigs of oregano on top of the potatoes and then the pork. Roast at 450 degrees for 15 minutes to brown the exterior a bit, then lower the heat to 375 and roast for another 45 minutes, tossing the potatoes once during roasting, or until it has reached desired temperature. I like it at 140 degrees F when I take it out of the oven. The juices run a little pinkish, but cover loosely with tin foil for another 15 minutes and it continues to cook, but gently. We served slices of this pork with pan juices and the potatoes, with roast asparagus - a yummy spring meal. The Roussanne was a really nice pairing. The nose was the best part for me after the initial woody blast, full of flowers and wet stones, some wax and something like poundcake too. Oily texture in the mouth, not much acidity in this wine, but still light and flavorful. Waxy and mineral palate, with some flowers and apricots too. I enjoyed this wine, but BrooklynLady liked it much more than me. I know that it is good wine, but it might not be my favorite style. I've been thinking about bottle variation lately, the differences that can exist between bottles of the same wine. I mean wine of the same vintage, same producer, same everything - you can buy a few bottles (some of us buy cases, I've done that only once) of a certain wine from the same store, and the individual bottles can show differently. I am not complaining about this, so don't get me wrong. Actually, I think it's kind of cool. To me it reflects the fact that wine is not uniform in aroma and flavor when it sits in wooden, cement, or steel vats, and that carries over to the bottle. That might be a romantic notion - I bet it is, in fact. The real reason for bottle variation is probably something more along the lines of variation in the amount of oxygen that passes buy individual cork closures, or something like that. It might be the effect of enjoying wine with dinner and friends, as opposed to sipping by yourself on the deck with no food. I definitely think that the environment in which I drink wine has a big impact on my experience of that wine. But I am trying to account for that when I consider bottle variation. Whatever the reason, I think of bottle variation as something that comes with drinking wine, like getting wet feet when you go fishing, or burning your finger when you cook. It happens sometimes and you deal with it, and besides being a momentary annoyance, it actually can become part of the overall experience, contributing in part to your love of that thing. I might be not be so magnanimous, by the way, if I was one of those guys who buys Latour or Rayas or Mugnier, and one or two of the bottles are just not as good as the others. At those prices, should a producer ensure that one bottle tastes and smells like every other? If so, then why not a $12 bottle? How would a producer do that anyway? Would they pour all bottles into a vat, stir well, and then re-bottle? Isn't that what happens before bottling anyway? Maybe not, maybe there is variation in barrels and each barrel is individually poured into about 288 bottles or 24 cases of wine. Should barrels be combined before bottling? Do we really want uniformity in bottles? I am not sure how I would answer these questions, except to say that I am fine with the way things are. I just find it interesting when I experience bottle variation. I hope, though, that the few expensive bottles I have taste as they "should," as the wine tasted when I decided, based on that taste, to buy more of the wine for cellaring.